When gay African-American actor Jussie Smollett was charged with making up a story about being attacked by President Trump’s supporters, said Matt Ford in NewRepublic.com, Trump and conservative commentators gleefully mocked “mainstream news outlets” for assuming the MAGA crowd are bigots. 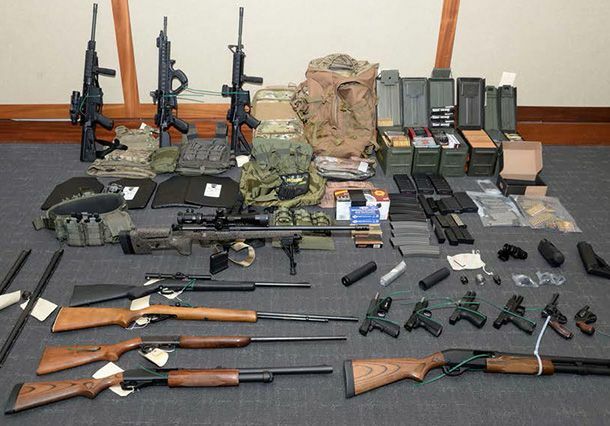 But when the FBI busted a heavily armed white supremacist last week for planning mass murder of Trump’s critics, they reacted with…“silence.” Coast Guard Lt. Christopher Paul Hasson, 49, was arrested in Maryland with 15 firearms and a browser history of searches such as “civil war if Trump impeached.” He had made a kill list of specific Democratic lawmakers and CNN and MSNBC journalists who’ve been critical of Trump. It wasn’t the first potential hate crime inspired by Trump’s overheated political rhetoric, said Peter Bergen in CNN.com. Weeks ago, a MAGA hat–wearing man physically attacked a cameraman at an El Paso, Texas, Trump rally. In October, Trump-obsessed Cesar Sayoc of Florida mailed 16 pipe bombs “to leaders of the Democratic Party and to CNN.” That same month, Robert Bowers murdered 11 Jews at a Pittsburgh synagogue after becoming convinced Jewish groups were encouraging “invaders” in a migrant caravan from Mexico. Hold on—Hasson is, indeed, “a crazy person and a white supremacist,” said Eddie Scarry in Washington​Examiner​.com. But the Left’s attempts to make Trump—and Republicans—responsible for his disturbed worldview “is a ruse.” Court records show he had no discernible ideology other than hatred for “liberalist/globalist ideology.” He actually welcomed the possibility of Trump’s impeachment as a catalyst for a race war that would “make his violent fantasy come alive.” Why should Trump “be expected to answer” for Hasson? Perhaps because of Trump’s endorsement of violent responses to those who oppose him, said Philip Bump in The Washington Post. During his campaign, he spoke of wanting to see protesters carried out on stretchers and promised to pay the legal fees of supporters who knocked them out. He called Rep. Greg Gianforte (R-Mont.) “my kind of guy” for body-slamming a reporter to the ground. Trump has called the media “the enemy of the people”—a phrase Stalin and the Nazis used to justify mass executions. Is it just mere coincidence that fanatics like Hasson and Sayoc seek to kill people on Trump’s enemy list?